Like many dog lovers, you probably love to travel with your dog. 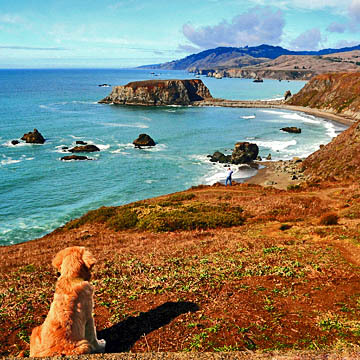 If you find yourself in Sonoma County for the day or a long vacation, here are four dog parks and half a dozen parks with beaches where Fido can romp and have a ball (or at least chase one). Your pet can be off-leash in the dog parks, but leashes are usually required elsewhere. Entrance to all parks listed here is free, but some require a parking fee. 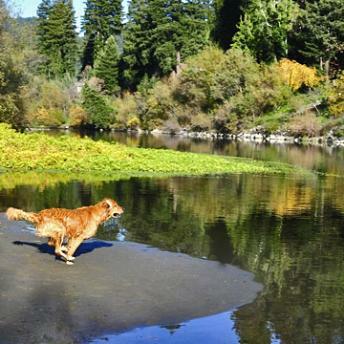 Founded in 1992, Rincon is Santa Rosa’s first-ever park just for pooches. It’s a fenced-in, three-quarter-acre doggie paradise within 18.7-acre Rincon Valley Community Park. Dogs can run about unleashed in the fenced lawn and wood chip areas, and also enjoy a small swimming pond. There’s also a doggie drinking fountain and separate areas for large and small dogs. Rincon Valley Community Park, 5108 Badger Road, Santa Rosa. Nestled within 157-acre Ragle Ranch Regional Park — site of the wildly popular Gravenstein Apple Fair each August — the Ragle Ranch Dog Park is half an acre with a redwood chip surface for cavorting dogs, as well as benches, shade trees, and water. Beyond the fenced-in dog park, Ragle contains 3.56 miles of mostly woodland trails offering good wildlife viewing opportunities. Ragle Ranch Regional Park, 500 Ragle Road, Sebastopol. Located within Ernie Smith Regional Park in El Verano, Ernie Smith Dog Park provides a pet drinking fountain and picnic tables. Beyond the fenced dog park you’ll find a children’s play area, a softball field and a one-half mile paved walking path with a wildlife viewing platform along the route. Ernie Smith Dog Park, 18776 Gillman Drive, Sonoma (El Verano). Doran Beach Regional Park (Bodega Bay) has a two-mile stretch of sandy beach. Forestville River Access (Forestville) offers a wide, sandy beach on the Russian River. Gualala Point Regional Park (Sea Ranch), has 195 acres that feature featuring open meadows mixed with coastal forests. Riverfront Regional Park (Healdsburg) has trails extending along the Russian River. Sunset Beach River Park (Forestville) has a beach and picnic area. For more ideas, read Pet-Friendly: Where to Go with Your Pet in Sonoma County and Pet-Friendly Restaurants with Treats for Your Dog. See Sonoma County's safety tips for water activities.